Slow rolling a spinnerbait is nothing new. It’s a great way to catch big bass in deep water when they first move offshore away from their spawning flats. However not every spinnerbait made works great as a slow rolling deep spinnerbait. There are a few necessary attributes that have to be considered. Blade size, weight, head shape and even trailers can alter how effective a deep spinnerbait is at running correct and enticing bass. 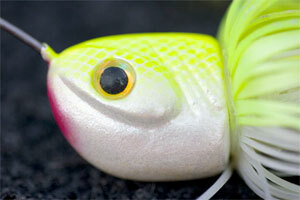 Strike King developed the Bottom Dweller spinnerbait last year and we’ve been testing it for a while. We like to do our tests on products at the most opportune times, and when the bite on that certain product or technique is at its optimal effectiveness. That way we get a fair reading on when the bait really excels at producing. The Bottom Dweller comes in three weights from 3/4-ounce to 1-ounce to 1 3/8 ounces. These options help the angler keep the bait down depending how deep he intends to fish and also how heavy the cover may be on the bottom. Too heavy a bait, you could stay hung up a lot. 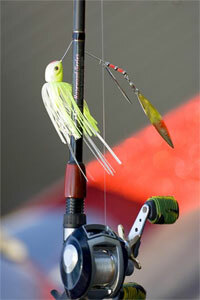 Too light a bait for the depth, you could be pausing a lot to let the bait fall back. With a heavier bait, you can work it a bit faster and still maintain good bottom contact – something guys often overlook. We tested the 3/4-ounce size because we were only fishing it in water from 8 to 20 feet, so that size was adequate for our testing. Our favorite color in the testing has been chartreuse and white although there might be one of the eight colors that works better for you on your fishery. The bait falls well. When starting the retrieve we found that it was best to snap the rod or pull it sharply to straighten the bait out and get the blades spinning right. The perfect skirt is an interesting concept, alleviating the need for a trailer. However we found on two occasions, the long strands on the perfect skirt twisted in the swivel of our blade and kept it from spinning. I’ve since gone to cutting those strands off and using a trailer like a Zoom Split tail or a Get Five Lures Dinero in White Rose. The head shape is interesting in that it acts as a gliding keel for the bait to keep it upright. One thing you don’t want a spinnerbait to do when you’re slow rolling it along the bottom and through cover is to lay over on its side, which will make it a lot more snag prone. With a large head we felt like we could keep it upright on the whole retrieve. We varied our retrieves from a straight reel to a pump and fall retrieve. Both worked for catching bass on ledges and deeper points. We liked a high rod tip for pulling the spinnerbait over brush piles and a low pointing toward the bait rod position for working it along the bottom. Occasionally we pause to be sure our bait is staying right on the bottom. Don’t pause too long as this allows the bait to lay on the bottom on its side. As soon as you see that instant of slack, start the bait moving again. The bites are generally pretty jarring on the spinnerbait. Occasionally we had some fish just swim up behind it and the bait just felt like it maybe had a leaf on it like there was a little extra drag and we couldn’t feel the thump of the blade anymore. The hooksets were good just about every time a fish really took the bait. They are notorious though about smacking at it. When they are doing that, we often change to a crankbait just to hook those slappers. But I was very pleased on how the bait hooked the fish and they didn’t seem to be able to throw the bait like I thought with the extra weight. I will say the wire did get bent out pretty significantly on a few fish but we were able to bend it back and keep on fishing it, without a drop in performance. You need a bit of a light wire to get a good thump in the deeper water, especially when they use their custom Razr blades. The Bottom Dweller features Razr Blades which are thinner, narrower cupped blades that won’t cause as much resistance. Because of that, the blades have less “lift,” and the bait stays on or closer to the bottom than conventional willow leaf spinnerbaits. The finish on the painted head has held up well to be drug on the bottom and landing several fish. 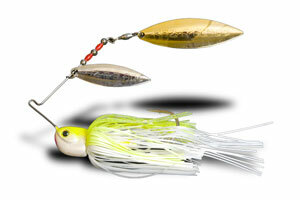 The Bottom Dweller retails for $5.99 at Tackle Warehouse and can be found in eight colors and three sizes. We liked the ¾ ounce bait and we intend to purchase some of the 1 and 1 3/8-ounce baits as well for working a spinnerbait a little faster in the deep water to get more of a reaction bite. It’s another great option for fishing deep that doesn’t require as much work as a deep crankbait.